How about the SWEET POTATO NOODLES?! I can’t even remember what got me on a ‘why don’t I start spiralizing some vegetables’ kick, but I landed on the kick in tandem to also finding Ali’s blog – Inspiralized – which is actually an entire blog dedicated to spiralized dishes. 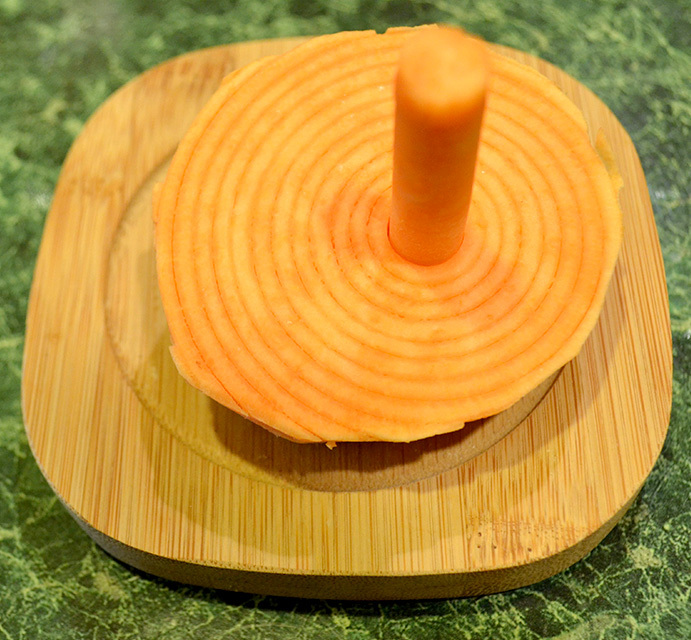 So, after I spent an entire afternoon lusting over her dishes, I decided to give some sweet potato noodles a try. Luckily I had a spiralizer already (this kind ) – a long-forgotten-wedding-present-that-I’m-sure-I-had-great-intentions-of-using-two-years-ago-or-maybe-I-just-added-it-to-my-registry-to-make-it-look-like-there-was-useful-stuff-on-it-because-isn’t-that-what-you-do-on-wedding-registries. So, I broke it out begged my Mum to give it back to me since she’d obviously borrowed it, and made some sweet potato noodles. Now here’s the thing. I had no idea how much noodle-matter one sweet potato would make. Plus. I was making dinner for both Nathan and myself. AND it looked like this outside. So there was no way I was going to go back to the store for more. So I got three sweet potatoes. And I prepped all three. (here is how you make noodles – so greatly explained by Ali). And I started spiralizing. Uhm. That picture up there? That’s after 1.5 sweet potatoes. Which, by the way, was more than plenty. For two meals. Each. Hey. By The Way. Spoiler Alert. The noodles? Divine. So now – this sauce. 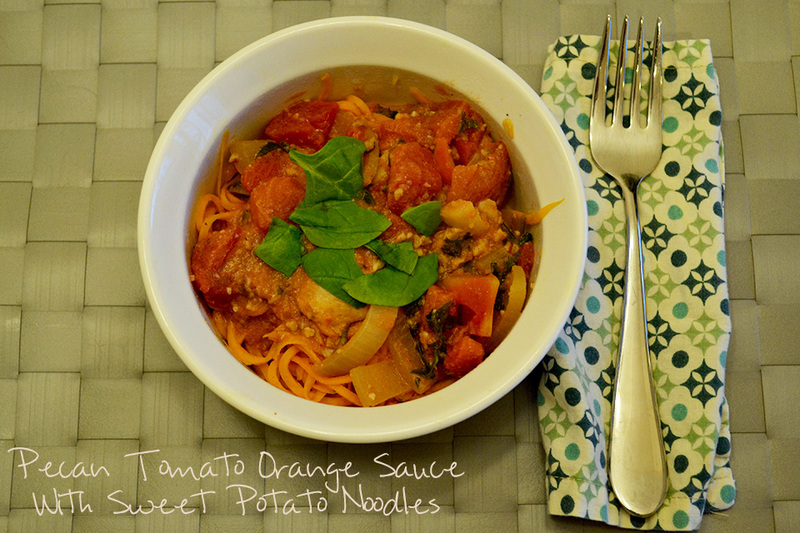 Pecan Tomato Orange Sauce. I have a confession. I started out to make spaghetti sauce. 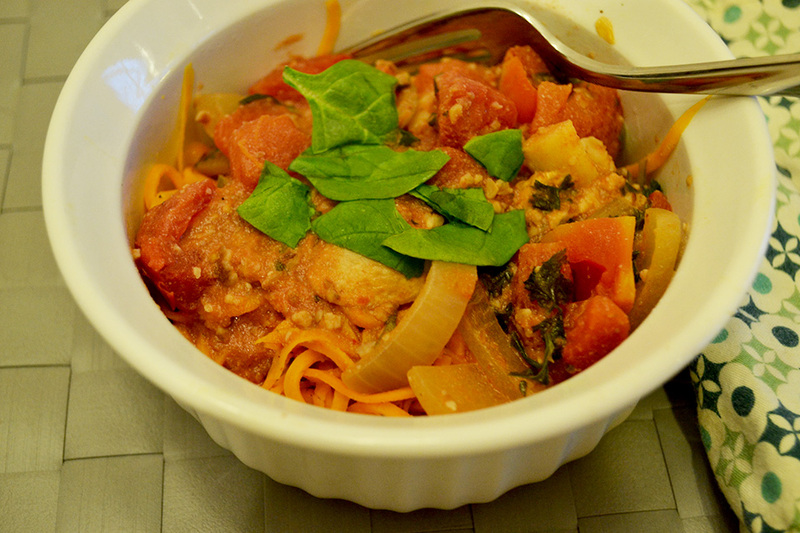 I have greatly avoided spaghetti sauce since we went gluten free – because we used to put morning star crumbles in it – which contain gluten – and without them, spaghetti sauce (and noodles) have a great deal of carbs/sugar with little protein (not that I’m big on counting carbs – but my blood sugar is). I got a wild hair to perhaps put some type of nuts in the sauce – to add some texture and protein. But I thought – for sure – that this was crazy, until I read Angela’s recipe on Oh She Glows, which contained walnuts. Feeling less crazy I set off to make my sauce. I wanted to make a vegan-Parmesan-of-sorts with pecans, nutritional yeast, and miso. I planned to crumble it on top of the sauce – but in a strike of laziness, just stirred it in – which turned the sauce into an amazing cream. Then came the orange. My friend had just returned from Florida (yep. we hate him. 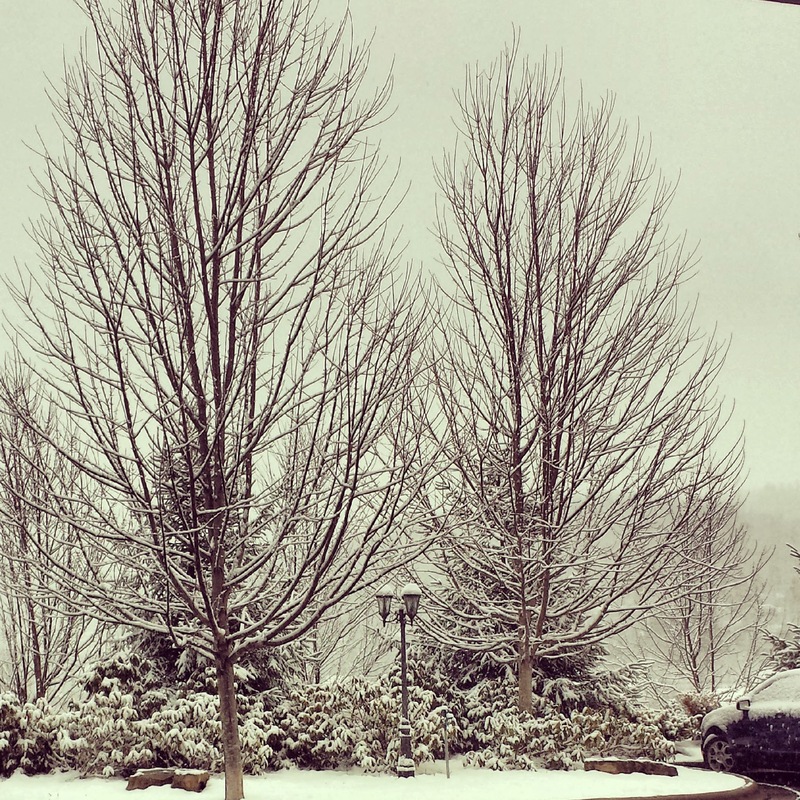 reference snow picture above), and had brought me a large bag of oranges. So – why not add a whole orange worth of juice to the pasta? And a little zest? Sureee. Uhm. Turns out. It is amazing. Although…not completely … spaghetti sauce. So. 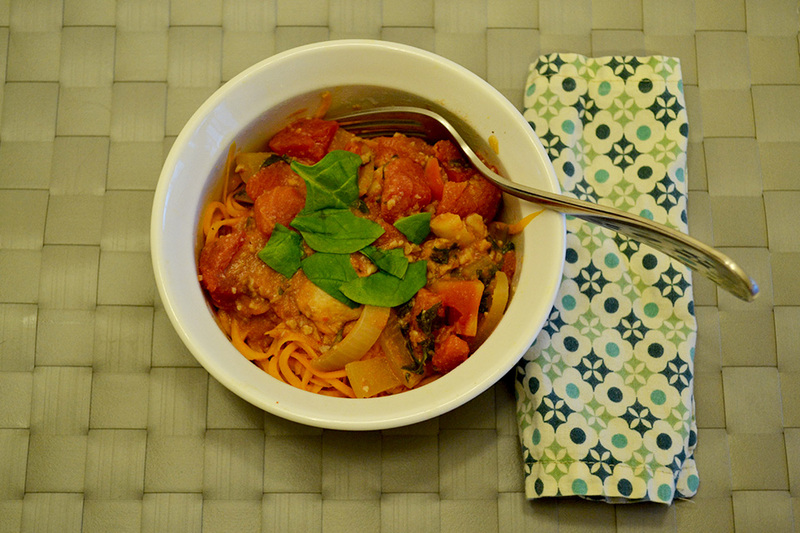 That’s kind of a long winded version of how this hot-mess-sounding pasta turned in to something really stinkin’ good. Oh, and spiralizing vegetables? I’m seeing a LOT more of that in my future. Especially because sweet potatoes look like this when you get done. Enough rambling. Let’s make it. Add the pecan mixture to the sauce after the 10 minutes is up. Stir well. Stir spinach into sauce right before serving as to slightly soften but not wilt it. Store leftover noodles and sauce separately. I only cooked enough noodles for the meal, and stored the leftover raw noodles in the freezer to cook up again the next night and that worked very well. I was SERIOUSLY skeptical. But these were AMAZING. I may even like them more than gluten free rice noodles. But, that wasn’t hard to beat. HA! Glad to join GFW! I am loving finding other blogs through it!! 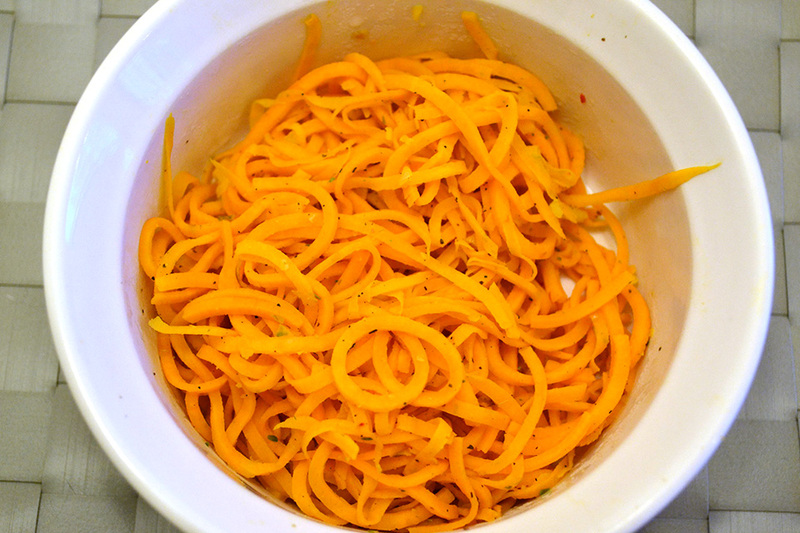 I am so impressed with the spiralizer. And – you’re right – definitely a money saver! Especially compared to GF noodles!! I feel very silly for not seeing this when I visited your site before, but yay! I’m so glad to see this recipe, and I’m definitely making this next week! Do you mind if I link to it on my meal plan post on Sunday? 🙂 I don’t mind a bit!!!! Thank you for stopping by!!!!! 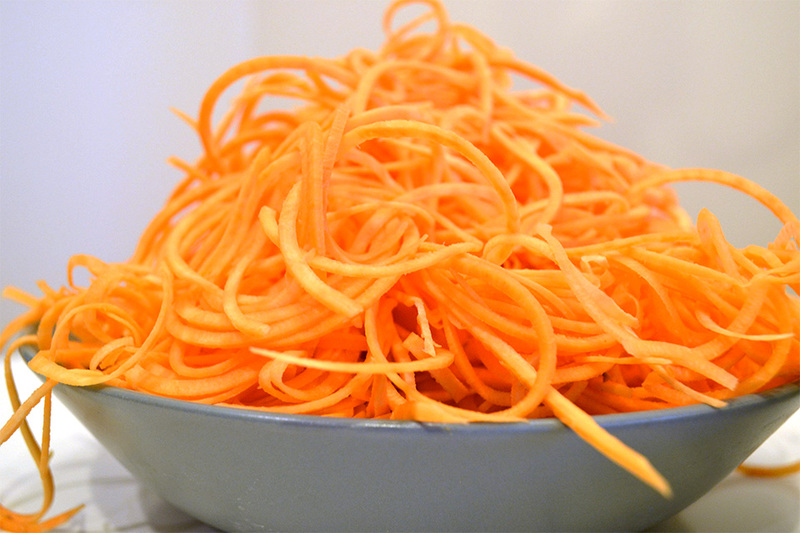 We’re totally loving sweet potato noodles around here lately! Such a cheap gluten free option!